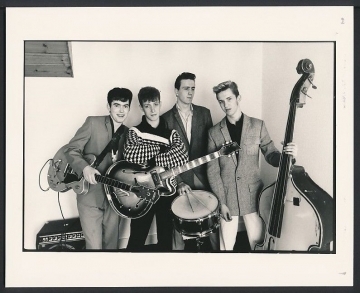 The Polecats are a rockabilly band formed at the end of the 1970s.The band formed in 1977 in north London. The original line-up was Tim Worman (a.k.a. Tim Polecat, vocalist), Martin "Boz" Boorer, (guitarist and vocalist), Phil Bloomberg, (bassist), and Chris Hawkes (drummer), who originally played under the name "Cult Heroes." Finding difficulty persuading promoters to book them on the rockabilly circuit with a name sounding "too punk", they adopted Hawkes' suggested band name The Polecats. Hawkes was later replaced by Neil Rooney; who was subsequently replaced by John Buck. The Polecats played rockabilly with a "punk sense of anarchy and helped revive the genre for a new generation in the early '80s".